The CC remains committed to engaging with Lothian Buses regarding the decision to introduce a new A200 airlink bus service from Leith using a route which seems incompatible with airport users and which barely touches the perimeter of the CC area. Alex Cole Hamilton has assured us that he will broker a meeting with the bus operator and with the CEC. His secretary is dogged in her efforts to secure the meeting. In the meantime, the operator has recently replaced the single decker bus with a double decker and has announced that this is in recognition of the success of the service in supporting Edinburgh Airport and against a background of around 10,000 passengers using the service each week. 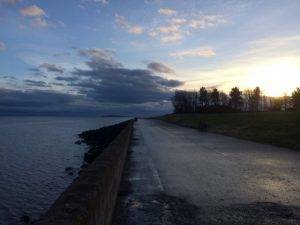 At agreed at the September meeting I have responded to the latest CEC consultation on the TRO designed to address some of the SSI consequences in the Cramond area. I have made it clear that the TRO is deficient in its coverage and that if implemented as is there will remain a significant risk to road users and children attempting to cross the Whitehouse Road in the vicinity of Fair-a-Far Shot. We have stated that the CC will, in the event of an accident or fatality, press for charges to be raised against whichever official signs off on the TRO unless changes are made. We await a response. I have also written in recent days to the CE HQ and CEC Hub about the Care Home on Cramond Place covering the temporary structure that is being used as the sales office/room mock-up and the need for traffic restriction measures to be initiated in the vicinity. During the week the section of Cramond Road North running from Cramond Place round to School Brae is already choked with on-street parking largely by staff from the GP surgery or at the private nursery. The structures for engagement with the CEC and the emerging documentation (Locality Improvement Plans) that is to be the focus of engagement remains work in progress within the Council despite a deadline of 1 October having been set by the Scottish Government. This CC along with and a number of CCs has expressed our dissatisfaction with the emerging LIPs and has made clear to the Edinburgh Association of CCs that this is the most important governance issue under consideration with the CEC at this time. If the CEC does not get it right, then it will fail to deliver the expectations of SG insofar as Community Empowerment is concerned and we and many other CCs will cease to have a formal mechanism for engagement with Council officials. required to sustain the heritage of the community. The CEC has advised that, having received legal advice concerning the Lauriston Castle Trust and all assets, it can enter into a long lease that will enable the works to proceed to create the desired facility for dementia sufferers and their carers.